How difficult is it to write about rainforests? Just to ask the question is perhaps to answer it. And to be frank, unless you have grown up in one, they can be unpleasant and often monotonous places. Of course they tick all the right boxes – climate change, environment, community. But all that rain, and all that biodiversity trying to eat you. Popular images of rainforests are like of those deserted tropical beaches in the glossy magazine. What you see if not what you actually get: when you are there what you really need is a cool beer or an ice cream, and a quick way to get out of either the gloom or sun. 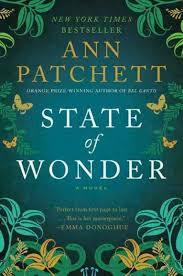 In “State of Wonder” by Ann Patchett (2011) the Amazon provides the backdrop to a quite ludicrous tale of big pharma, scientists going native, thwarted careers, abandoned children, chemical dreams, nightmares, and comes complete with births – two impromptu caesareans (one failure, one success), a resurrection (a lost husband), a crucifixion (poor Easter, a deaf child and a lost son), a good tribe (the Lakashi tribe, whose women chew bark in situ) and a bad tribe (the Hummocca, who are cannibals). All this in the search for a miracle fertility drug or an unprofitable malaria vaccine, against a predictable backdrop of anacondas, snakes and bugs, and without any apparent argument (morale or otherwise) to hold the novel together. Bates was a keen observer of all creatures great and small and a tremendous writer, for example, speculating on the time spent by ants in relaxation and grooming. He had no illusions about the”gloomy expanse of forests and water”. But he also shows a strong empathy with Indian tribes, noting their lack of interest in accumulating land or other property, puzzling about their almost atheist outlook – perhaps now not so surprising – and admiring their “…contended, unambitious and friendly life, a quiet, domestic, orderly existence, varied by occasional drinking bouts and summer excursions”. The dependence on hunting is noted, but also the tribes’ own observations that turtle numbers in the Upper Amazon are declining as a result of the over-harvesting of turtle eggs, and their strong aversion to killing dolphins. … it is under the equator alone that the perfect race of the future will attain to complete fruition of man’s beautiful heritage, the earth.